He may be an accidental entrepreneur, as the Director of Beaufort Properties describes himself; but Mr. Ernest Hanson is certainly surfing the crest of a swelling wave in Ghana’s burgeoning Real Estate industry. Beaufort’s current project is an iconic six-storey, 61 apartment complex at the centre of Accra at North Ridge. The “Beaufort Ridge” development was designed by leading international architect firm, Paragon. The company has nominated Micheletti, one of the top contractors in Ghana, to be the lead contractor on this project). The development comes with a number of amenities including backup generator, water, swimming pool, club house, gym, meetings rooms, barbeque area and extra storage units. In addition in-built Mini-VRV air-conditioning systems are being installed. These are more energy efficient and they provide full redundancy to ensure home owners can still use all their appliances during power outages. Another key green feature is the borehole and filtration system: lowering dependence on municipal supplied water and reducing running costs for prospective home owners. “Our target market is the professional class which, I think, has largely been ignored by the industry. So Beaufort is looking at doing apartments at price points which target a larger yet under-served market of young professional Ghanaians and increasingly price conscious expatriate workers. For this group, their lifestyle dictates that they are conveniently located around the centre of town where they can be close to the action; go to work early and come back home late after work. “It means a young couple who are working professionals, say a lawyer and a banker, can each afford to contribute US$750 a month to the household budget,” Hanson explains adding that they are targeting a more buy-to-live market than a buy-to-let market. “We want more professional Ghanaians to be able to live in the centre of town at decent price points and that has been our philosophy. That’s our market. There is a lot of commentary around the growing middle class but I would prefer to add that we are primarily looking at the professional class market, which is in need of housing in central locations,” Hanson says. Given that Beaufort sold 25 out 61 of the apartments in the first month alone, and presently has only six units remaining, Hanson and his joint venture team at Beaufort seem to be positioning themselves for the growth in the sector. The development of the mortgage sector and access to finance for Ghanaians will further boost the prospects of the sector. So how did a young man, with no training in architecture or construction, get to be so well established and successful in less than no time, in Ghana’s Real Estate industry that is still bedeviled with fundamental challenges? “I was brought up to be academic: my father was a medical doctor and working for myself was something I thought I would do much later in life, like after retirement; certainly not at 20 or 30 years,” Hanson reveals of his early outlook on business. Raised in Asylum Down and Latebiakoshie , Hanson’s family later moved to Cape Coast where his father was posted. In 1989, at about the age of nine, Hanson had the opportunity of going to a boarding school in the UK where he spent the best part of nine years, and then on to the London School of Economics (LSE) where he studied Economics and geography . His main interests at LSE were economic history and development economics. His early career fantasies were to either work with the World Bank or become an ambassador. “After university, I realised that to be at the World Bank you needed to have a PhD after your name and I also wasn’t seeing anyone even as old as 30 years being an ambassador. Luckily for me, I was in London and all my friends were going into banking so, I got swallowed into the whole financial sector,” Hanson says, of how he got into his first job in project financing, doing economic impact reports on infrastructure projects in South America and in the UK. He later got hired by a US-based investment bank as an analyst to do corporate finance and capital raising for small and medium sized media & technology companies. That was in 2005. In 2006, while he was in America, his father passed away. “That was a real turning point in my life because I took a month out of work, came to Ghana and did nothing but spend the whole time with my family, driving around town and that gave me the opportunity to see what was happening in Ghana at that time. “I could see a lot happening in terms of construction, and also new businesses such as the roll out of mobile telephony by MTN ( then areeba),” Hanson recollects of the notable changes about the new Ghana from the one he knew as a boy, which planted in his mind the thought about the possibility of relocating to the motherland. “And given the fact that I went to boarding school in the UK, one of my biggest regrets was not spending enough time with my father in Ghana and I didn’t want the same happening with my mother, so at that moment I had a plan to return home and spend time with the family,” Hanson recalls. As fate would have it, Hanson got hired by Lehman Brothers to be an equity analyst covering European TV stocks. His job, as an analyst was primarily in stock valuations and industry research reports. Technology and media were his background for most of his early working life. In May 2008, he attended an investor conference for the management of media companies to boost their profile to UK based investors. At this conference, there was a Swedish company called Modern Times Group, the company that now owns the Viasat TV channel in Ghana. “I was looking to cover them and give them exposure to UK investors. I noticed that their main business was in emerging markets and Europe but they wanted to try out Africa. This is a story where its pays to follow your stomach – I was simply waiting for lunch to be served before leaving the conference but I was made to sit up when a slide caught my eye. I saw a map of Ghana and immediately wanted to know what was going on,” Hanson reveals of yet another of a series of accidental events that marked lucky turning points in his life. So he raised money from the UK through his network of investment bank colleagues and friends. “I said; ‘look, put a couple of thousand dollars here and I’ll double your money’; they bought into the vision and trusted me with their money, so I changed the idea of building a university hall of residence to doing eight town houses in East Legon”. He started the project with about US$80,000. He was able to turn this into US$1.2 million of sales. He adds that he did this by moonlighting as a real estate developer whilst working full time for Viasat. He was able to complete the project in 2009, a year after returning to Ghana. He realised that if he did this on a full time basis, he could make a decent living out of it. So Hanson, in 2010, left Viasat and decided to go full time into real estate. “Based on the success of my first project, I raised more money from London and brought in a school friend to assist and we set up a company called Clifton Homes, which did big things in East Legon, and has billboards all over town. “While at Clifton, I sold over 150 apartments and it was a great experience. And from 2012, with my corporate finance background, I realised this was time to grow up the business and therefore the right time to exit, so I sold my stake in the company to the Clifton shareholders, took some money out and set up the new company, Beaufort Properties in March 2012. Speaking as one who has successfully transited from a salaried job to doing his own business, Hanson says; “for me I feel very fortunate in my transition from employee to employer. Whilst I was working, I was very transparent with my bosses; I told them this is a bit of project I’m doing on the side, it takes my weekends and my mornings. It didn’t affect my work so they allowed me that flexibility. “Personally, I feel only the very brave are those that go straight into setting up a business from scratch right from school. “True entrepreneurs, true risk takers, go straight from school into business but I think for the average person, a transition is always useful because, for me, I had the opportunity to learn. I think, when you go straight from school to your business the mistakes you make will be costly. “It is better to make mistakes when you’re working for someone than when you’re working for yourself and I think people should not take working for someone as a negative. There are certain positives and lifetime skills you can develop by working for other people,” Hanson says, attributing that experience to how well he has traversed the difficult terrain of transiting from a chance builder to a world class Real Estate developer in a relatively short period of time. For Hanson, hanging on in the Real Estate business is not a just a matter of passion; “I think success and passion go hand in hand. If you’re an entrepreneur, you’ll try and go elsewhere if you are bleeding cash. You can’t bleed cash and still hang in there just because it’s your passion. Ultimately success, or at least the prospect of it, enables you to continue. Success must be key. “I am not a builder, I didn’t learn architecture, I didn’t do construction management. I was very lucky to have accidentally tip-toed my way into the building industry. “What I’ve also realised is that the mistakes that maybe some developers make is that they don’t appreciate the fact that, Real Estate, at its core, is finance and marketing and those are the skills that I brought from my banking experience and from my time at Viasat. As a developer, once you get the finance and the market right, the actual building you can always outsource to an expert. “So my take is I’ve been lucky, I got into the industry by chance but I’ve learnt a lot and I’m continuing to learn. In my interactions with architects I’ve learned to read floor and building plans which all help you in your decision making. When looking at land, due to my interactions with the technical team and construction managers, I can now look at a piece of land and have an idea of how it might impact the construction cost. “You learn by your interactions with the best,” Hanson says. Indeed, he may have tumbled into his beautiful castle, as Hanson loves to explain his fortunate experience with private business, but there is no denying that his sharp analytical skills, his determination to learn and apply knowledge, as well as an eye for spotting opportunities, have all collaborated beautifully to propel him up the crest of the wave. 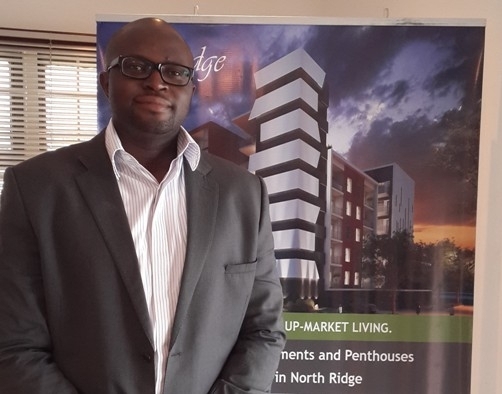 With those same skills and knowledge he looks set to ride the waves of Ghana’s flourishing, but sometimes turbulent, Real Estates sector for a long time.